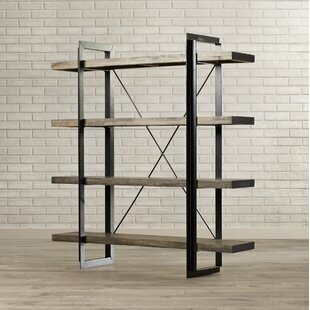 Rustic style with a contemporary touch 4 level shelf. Solid Wood and metal construction. 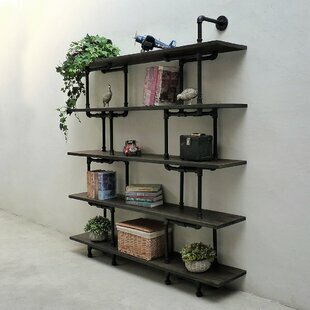 Frame Material Details: Iron Shelf Material: Wood Wood Species: Mango Shelves: Yes Overall Product Weight: 117lb. 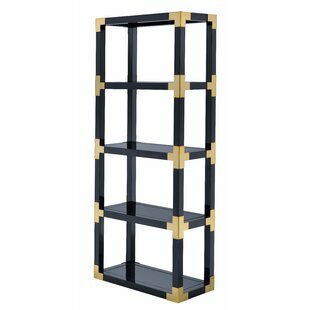 Geometric design of the Berlin bookcase was created to blend in any living area or home office. This multi-purpose piece can store much more than just books. 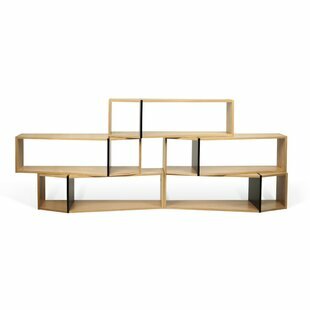 And when combined with the optional Berlin box, this shelf can bring a splash of color any room. 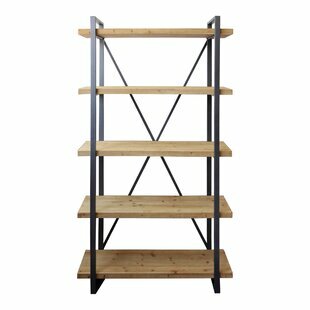 Shelf Material: Wood Assembly Required: Yes Overall Product Weight: 101lb. 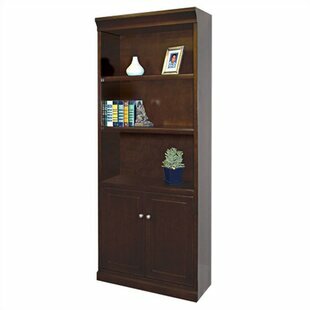 This Dravin 2 Drawers 36" Standard Bookcase will deliver plentiful storage and display space to the home. 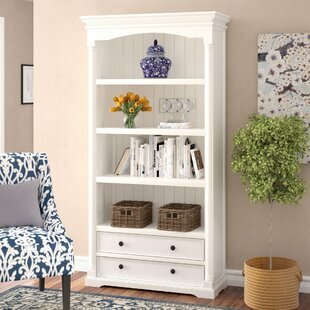 Two top drawers give this piece ample storage room, four shelves underneath are perfect for books, display your decor, and other everyday essentials. This simple and classic design will go with any of your room decors and makes it a great addition for any room. Shelf Material: Wood Drawers Included: Yes Number of Drawers Included: 2 Assembly Required: Yes Overall Product Weight: 75lb. 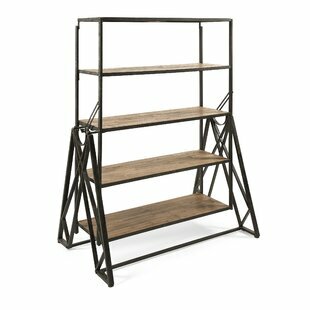 Amp the aesthetics and functionality of any office or living space with this pipe bookcase featuring a light weight modern and industrial vintage design. 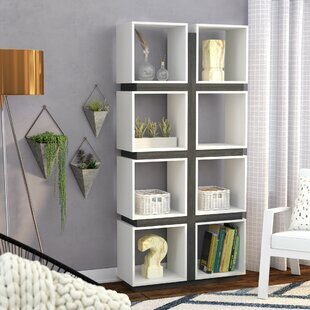 Each component of the Eugene Etagere Bookcase is expertly-crafted from the finest materials including aircraft grade recyclable aluminum and sustainable reclaimed finished solid Paulownia (lightest to strongest ratio wood species in the world) wood. 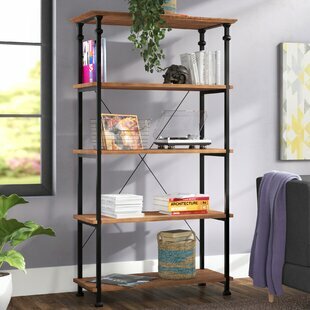 Anyone would love the ease of assembly and the edgy style this purposeful pipe bookcase brings... Frame Material Details: Aluminum Shelf Material: Wood Wood Species: Paulownia Assembly Required: Yes Overall Product Weight: 60.5lb. 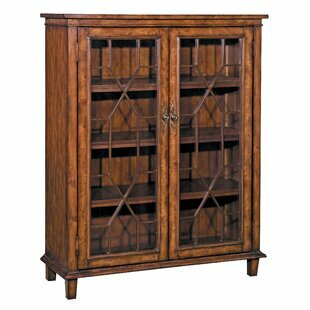 Since 1991 the experienced craftsmen have produced high quality furniture that is made in the USA. Use only premium quality solids and veneers. No particle board! To control quality the wood was milled in the modern manufacturing facility. From doors to moldings, every part is manufactured on-site. Exposed shelves have solid front moldings. Boxes are constructed from Baltic Birch. A multiple step sanding process ensures a consistent surface for finishing. Use Sherwin Williams stains, sealants... 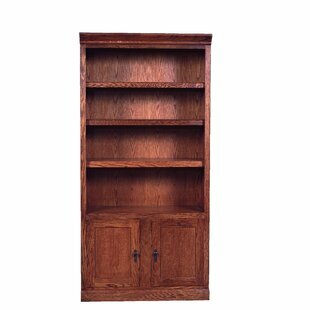 Shelf Material: Wood Doors Included: Yes Assembly Required: No Overall Product Weight: 80lb. Inspired by the kathy ireland Home Americana Style Guide, Huntington Club is a transitional furniture design with a vibrant cherry finish on hardwood solids and veneers. Vertical fluting, dentil molding and light distressing add character and aesthetic appeal. Huntington Club is a great addition to any home and will surely last for generations to come. 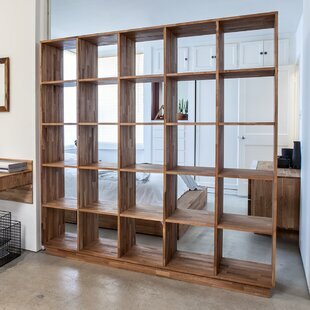 The Bookcase features five adjustable shelves and two fixed for storage. 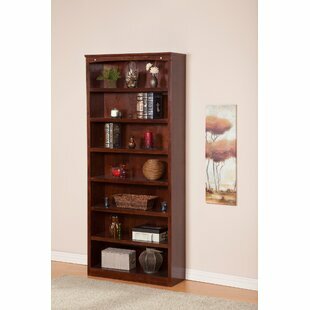 Frame Material Details: Veneer Shelf Material: Wood Assembly Required: No Overall Product Weight: 120lb. 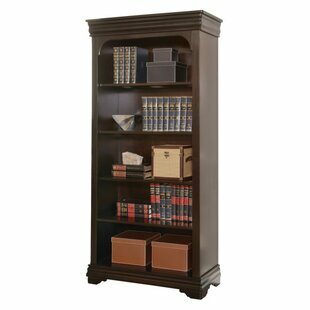 Inspired by the timeless appeal of American classic furnishingswhere character-rich materials, sturdy silhouettes and thoughtful detailing speak volumesthis bookcase revisits tradition in style. Rough milled pine is naturally textured and enhanced by a deep finish with gray undertones. 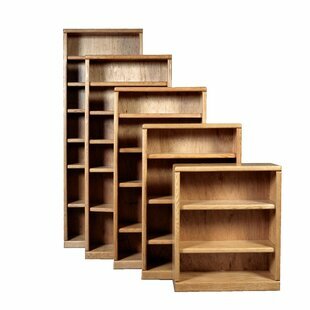 With a plank-effect back and adjustable shelves, form and function stacks up beautifully. 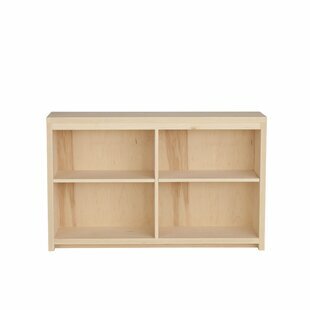 Shelf Material: Wood Wood Species: Pine Assembly Required: Yes Shelves: Yes Overall Product Weight: 75lb. Performing the double duty of a bookshelf and a dining table this versatile decor certainly deserves your attention. So; well made from good quality materials it will stay in good condition for a long time. 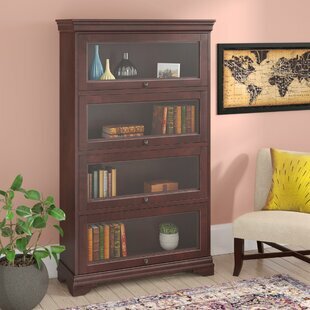 This Shirl Classy Convertible Standard Bookcase has a natural wood and black finish; while using it as a bookshelf; its four sections can be used to stack books or display your favorite decor collection. If you wish to use it as a dining table; simply fold all the sections and make it a flat... Shelf Material: Wood Assembly Required: No Shelves: Yes Overall Product Weight: 62lb. 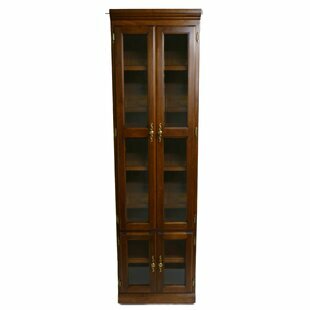 Frame Material Details: Wood Veneers and Particle Board Assembly Required: Yes Overall Product Weight: 229lb. 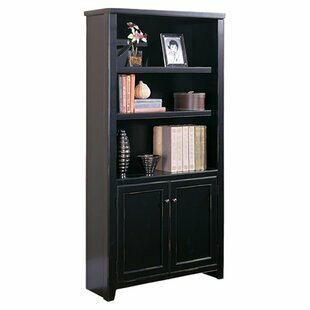 The Outside Corner Unit Bookcase can stand alone or be placed on either side of an entertainment or library wall. 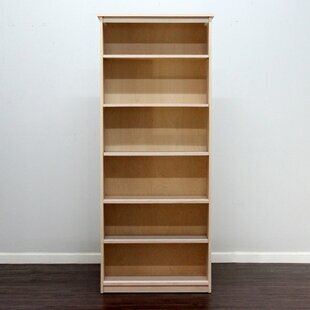 Shelf Material: Wood Assembly Required: No Shelves: Yes Overall Product Weight: 52lb. 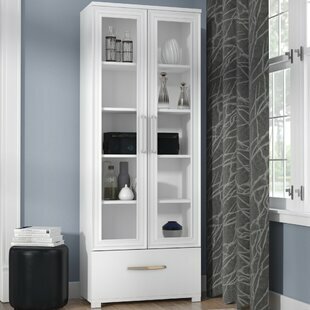 A classic mission look with insert panel doors, a contemporary handle design, and mission style moldings. Shelf Material: Wood Assembly Required: No Shelves: Yes Overall Product Weight: 60lb. 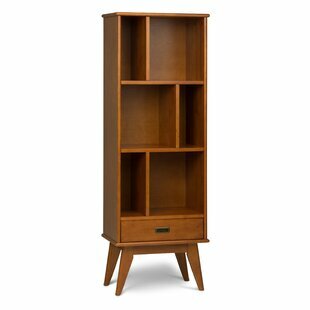 Display your favorite books and keepsakes in the Draper Mid Century Standard Bookcase. 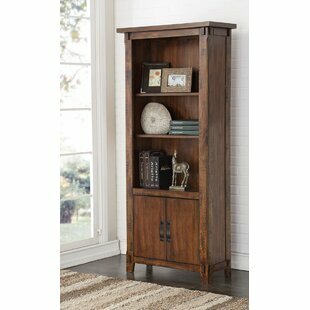 This piece is crafted from solid hardwood and combines a Mid Century modern design with function. 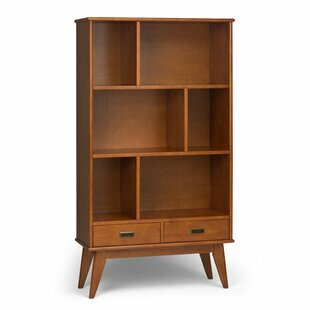 The Draper Mid Century Standard Bookcase features 6 shelves and a drawer providing the ultimate solution for all your storage needs. Tapered legs and a warm toned medium auburn brown finish delivers a clean-lined, contemporary feel to your living room, family room or home office. Shelf Material: Wood Drawers Included: Yes Number of Drawers Included: 2 Assembly Required: Yes Overall Product Weight: 104.7lb. 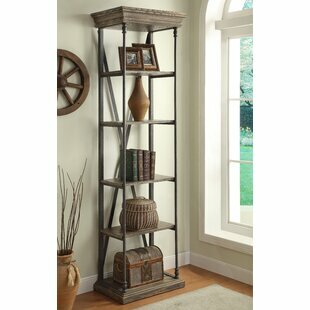 Rustic and bold, this etagere has the natural charm of reclaimed wood. Finished in a warm and neutral medium brown, it has a slab top, balanced with a slab-style base, both with beveled edges. 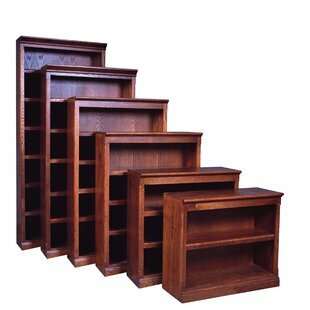 Four shelves provide plenty of storage or display space. Iron legs and accents offer an industrial feel as well as support. Frame Material Details: Steel; iron; slab Shelf Material: Wood Assembly Required: Yes Overall Product Weight: 97.06lb. 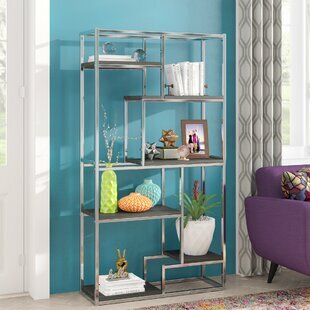 Featuring a unique frame design that provides plenty of storage, this Evon Industrial Etagere Bookcase is a perfect example of stylish industrial design! The circle-shaped metal frame both supports and adds a visual element to the design, resting atop the curving metal legs near its base. Each of the four shelves come with an open-backed design and a spacious surface to support either decorations or your favorite books. 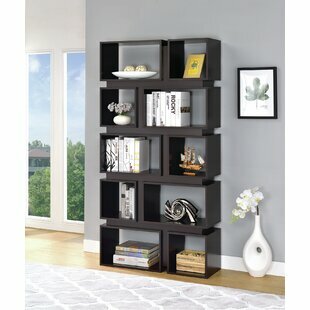 Complete with a dark gray and black finish, this book shelf will instantly... Shelf Material: Wood Assembly Required: Yes Shelves: Yes Overall Product Weight: 83.5lb. 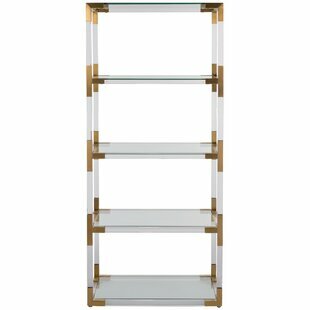 Frame Material Details: Metal tube Shelf Material: Marble Assembly Required: Yes Overall Product Weight: 52.8lb. 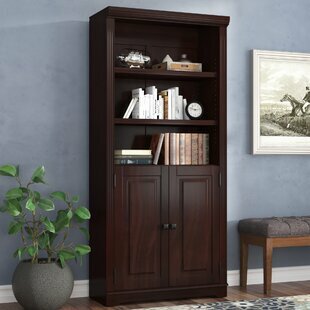 Curate your own impressive novel collection with this handsome wood bookcase. The gloss finish gives it a touch of shine and elegant appeal, perfect to effortlessly elevate any ensemble. Frame Material Details: Particle board Shelf Material: Wood Assembly Required: Yes Overall Product Weight: 98lb. 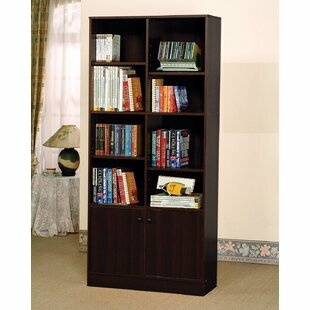 Decorate your living or office space with this contemporary 71" Standard Bookcase. The legs are glass that decorate the side of is from top to bottom. Drawers Included: Yes Number of Drawers Included: 2 Assembly Required: Yes Overall Product Weight: 177lb. Made in the USA yet utilizing minimalist Scandinavian design, this contemporary home entertainment collection complements any interior style from an urban dwelling to a dorm room setting. Maple solids and veneers are highlighted by a rich, Mocha finish that speaks volumes for the clean lines and simplistic features of any of the collections. 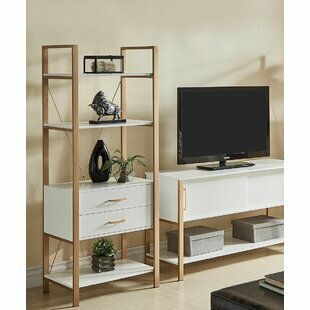 Frame Material Details: Maple solids and veneers Assembly Required: No Overall Product Weight: 98lb. Drawers Included: Yes Number of Drawers Included: 2 Assembly Required: Yes Drawers: Yes Overall Product Weight: 95.96lb. 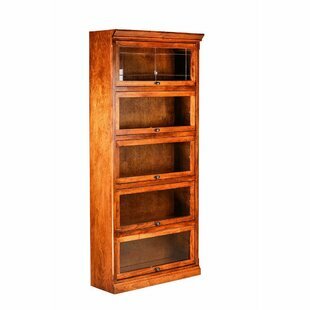 Get your books off the floor and onto this classic, durable, real wood bookcases from the Lexington collection! 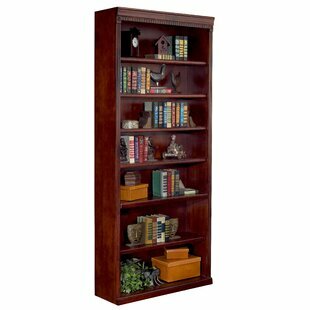 Handmade to high quality standards these bookcases feature adjustable shelves and a solid design that is guaranteed to hold your private library for a lifetime. Made out of real birch plywood and real birch wood veneer edging. 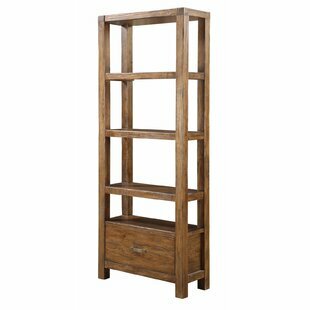 Frame Material Details: Birch Shelf Material: Wood Assembly Required: No Individual Compartments: Yes Overall Product Weight: 73lb. 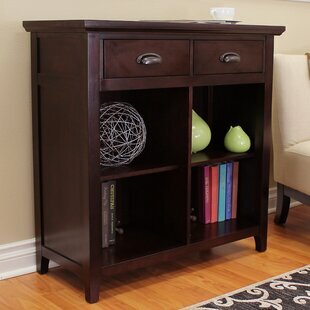 Bring the trending classic style into your home with this updated Thompson side table. 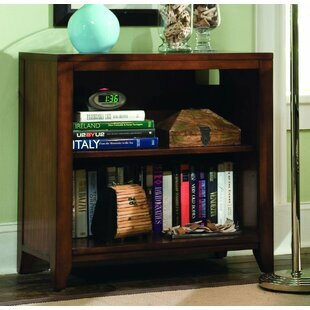 This side table comes with a drawer providing you an additional space to storage. 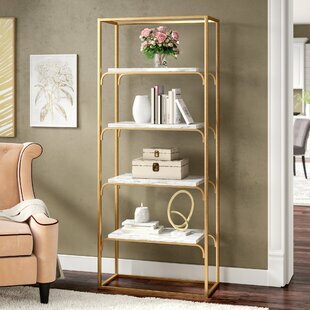 With featuring white or black top and brass base, this accent piece will be an elegant piece for any decor. 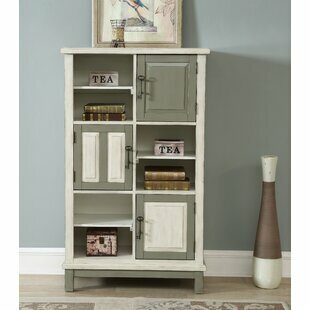 Shelf Material: Wood Doors Included: Yes Number of Doors Included: 2 Assembly Required: Yes Overall Product Weight: 83lb. Think forward with furnishings that support your expanding workspace. 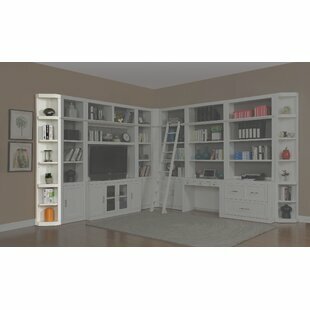 The Safco Cube Unit Bookcase is a perfect addition to your workspace with clean lines and traditional design. Baby your space with sturdy shelving that accommodates your work environment. Cases come with standard shelves with shelf-lock fasteners. Drawers Included: Yes Assembly Required: Yes Overall Product Weight: 68lb. Professional canoe guides and outfitters have relied on plastic or fiberglass for their fleets of boats. Each of them has its own merit. One is inexpensive, the other light. But none of them has the beautiful look. At Woodenboat USA, they are determined to make something beautiful and at the same time strong, durable and lightweight. 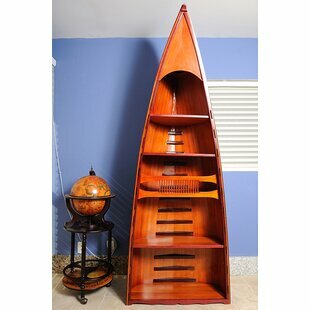 All of the canoes / kayaks are assembled from strips of top graded Canadian cedar (a very rare, soft yet strong timber) and then encapsulated in fiberglass with... Frame Material Details: Cedar Shelf Material: Wood Assembly Required: No Overall Product Weight: 40lb. The LAXseries by MASH Studios combines sleek, minimal elegance with practical space-saving solutions built into the designs. The piece features simple lines and a clean palette of a light walnut finish helping you create a contemporary environment that is clean and free of clutter. 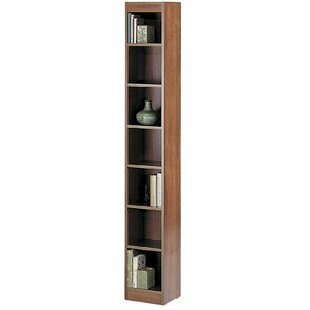 The LAXseries Compartmentalized Bookshelf allows you to browse titles easily on its clean shelves made of solid light walnut with a natural oil finish. 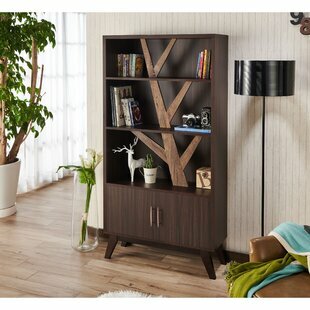 Since your literary collection should speak louder than your... Frame Material Details: English walnut Shelf Material: Wood Assembly Required: Yes Overall Product Weight: 190lb. 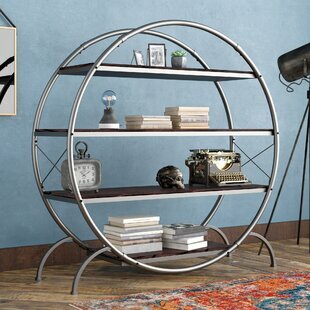 Frame Material Details: 22 Gauge steel Shelf Material: Metal Assembly Required: No Overall Product Weight: 68lb. Classic contemporary with rounded edges, solid fronts, and clean lines. 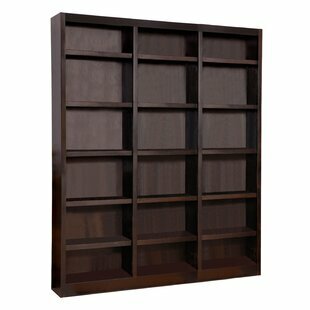 Shelf Material: Wood Shelves: Yes Overall Product Weight: 60lb. 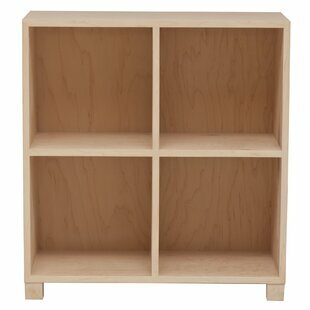 Shelf Material: Wood Assembly Required: No Overall Product Weight: 88lb. 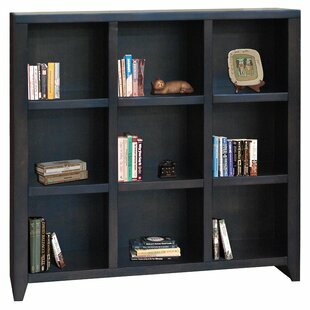 The open bookcase finished in a trendy black with gold corner accents frame. 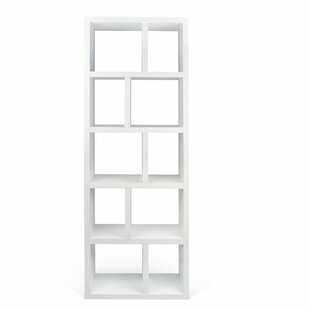 Use this to keep books, picture frames, and other mementos. 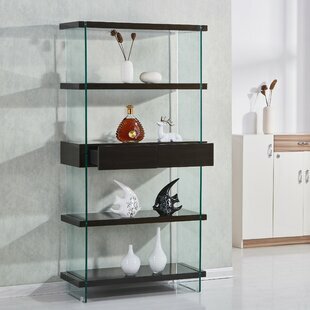 Features five spacious black mirror glass shelves for storage and display. 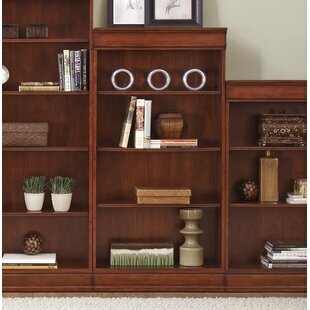 This bookcase is the perfect fit for any room in your home. Some assembly required. 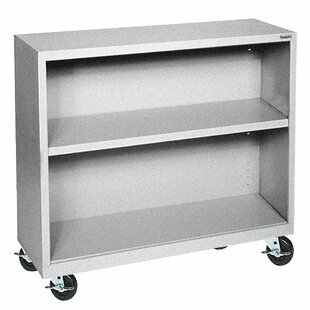 Shelf Material: Metal Assembly Required: Yes Overall Product Weight: 114lb.